Given the long weekend and the fact that I had some Southwest Airlines tickets to use, we decided to visit San Diego. I’d never been, but years ago Todd traveled there on business and never forgot the natural beauty and gorgeous weather. Talking him into a trip to San Diego wasn’t very difficult. Plus, I was itching to try something called VRBO – a service that lets you rent someone else’s condo. If you like to travel and haven’t browsed VRBO’s inventory, beware! You can get sucked in. The site lists condos all over the world and includes prices, amenities and photos. I used all this information to choose our condo on the shore of Sail Bay in Mission Bay. If you are vacationing in San Diego, Mission Bay is a great location because it’s convenient to everything. 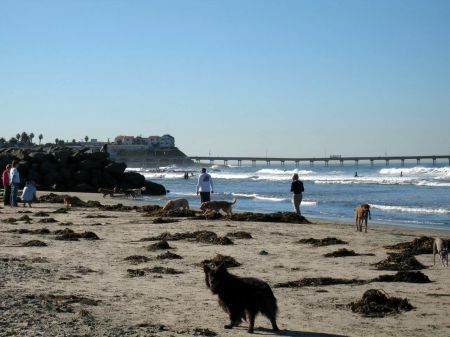 It’s adjacent to Pacific Beach and Ocean Beach, a short drive to Sea World, downtown, Coronado Island and La Jolla. La Jolla and Coronado are both on different sides of town, so staying in Mission Bay puts you right in the center of things. There are some nice hotels in Mission Bay, but there area also lots of condos. If you can find one, I recommend staying on the shore of Sail Bay. If you decided to use VRBO, look for something on Riviera Drive, which puts you right on the shore of Sail Bay. There are advantages to staying on the bay rather than the ocean. Number 1 being it’s much quieter. There isn’t a tide, so you or your children can go wading just about any time, and there’s lots to see out the window – sailboats, rowing teams, skiers. From our condo, we could see all the way over to the other side of the bay. Plus, there was a little playground about 50 yards. Everything about the condo was wonderful. It had every amenity you could ask for except air conditioning, but it didn’t need it because San Diego’s weather is so spectacular. For fresh air, one simply opens the sliding door to the deck. 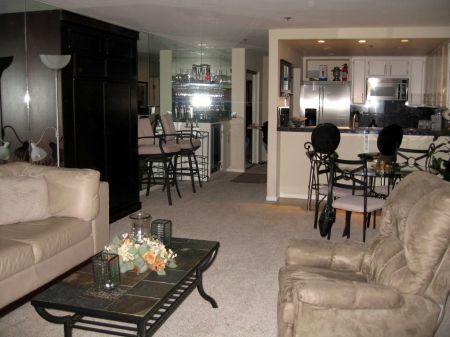 If you are interested in this particular condo, shoot me an email and I will give you more info. After getting acclimated, we decided to find the local Trader Joe’s so we could load up the kitchen with snacks. I wasn’t planning on cooking, but we did want breakfast goodies, fruit, drinks and snacks. Trader Joe’s was less than a mile away on a street called Garnet which was what you’d expect in a beach town. Todd & I counted at least 4 smoke shops, which was kind of strange. There was a laundromat, an American Apparel store, a few little grocery stores and many small restaurants including a famous fish taco place called Rubio’s. But we’re not so into fish tacos. What we are learning to love is sushi, so for dinner went to a place called Sushi Ota on Mission Bay Drive. It’s located in a strip mall next to a 7-11, but they are known for serving the best sushi in San Diego. I had vegetarian sushi, Emma had fried rice and Todd had a spicy tuna roll and sashimi that had to have been the freshest we’ve ever tried. For dessert, they had green tea ice cream, but we skipped that and opted on going back to the condo for chocolate chip cookies. 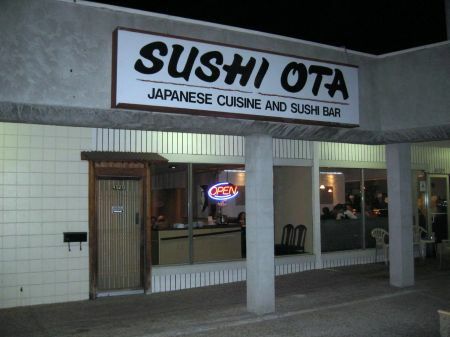 But if you like sushi, definitely make a reservation for Sushi Ota. It’s small, but the atmosphere is bustling and comfortable and people watching is excellent. The time change was killing us. We had dinner at 7 PST which was really 9 back home. Fuzz was exhausted so we headed back to the condo and went to bed. The next morning we woke to noises from the bay – sailboats, skiers and birds. We had our Trader Joe’s breakfast (granola, Zen Bakery muffins, bacon) and planned our day. We wanted to go to Sea World, but we were still on Texas time. Emma had woken up at 4:00 AM and Todd and I were up at 6:00. Sea World didn’t open until 10:30, so to kill some time, we drove over to a place called Dog Beach, which was a couple of miles away. Dog Beach was one of Emma’s favorite places. It was a Saturday, so there were at least 50 or dogs running around. The tide wasn’t too high either, so Emma and Todd did some swimming and I sat on the sand and played with dogs and watched surfers. Oh, and I forgot to mention – the temp was around 70 and sunny! Around 10:15, we headed over to Sea World, which was only a couple miles away. Sea World San Diego was surprisingly small. I had no idea our San Antonio Sea World was so much bigger, but we kind of liked the compact Sea World because it was less overwhelming and easier to get from show to show. Lines weren’t too bad so we rode Atlantis twice (San Diego Sea World doesn’t have any other roller coasters) then saw the Shamu show, the pet show, the dolphin show (don’t miss that one) and visited some of the exhibits. We enjoyed ourselves and were able to see a lot before leaving at our goal departure time of 3:30. We wanted to have enough time to do another quick Trader Joe’s run and rest before heading to La Jolla for dinner. Again, Mission Bay was a great location because it was so central. It was easy to dart from one part of San Diego to another. After Trader Joe’s and a little break at the condo, we drove over to La Jolla where we had a 7:00 reservation at George’s Modern on Prospect Street. Our goal was to see the wild sea lions at Children’s Pool before going to dinner, but when we got there it was completely dark and there were only a few people out on the beach – a few of whom were making out, and we didn’t want to bother them. Luckily, there was lots of distraction for Fuzz — music and festivity coming from the restaurants and clubs above the cover. La Jolla seemed like a fun and very active place to be. We made our way back up the hill leading from the shore to George’s Modern. The restaurant itself was classy with comfortable chairs and views of the ocean. The menu was fairly gourmet (they gave us three different types of salt) but not ridiculous and we were able to find plenty of things we liked. I had a hard time choosing between a filet mignon or butternut squash ravioli but ended up going with the filet. Todd had a garlic chicken dish and a salad made with roasted quince and persimmon. The bread was from a nearby bakery and was excellent and there was a nice choice of interesting cocktails to choose from. We stuck with wine, though. There was no children’s menu, but I noticed a little girl nearby eating plain spaghetti and Fuzz was given an empty plate so that she could share my meal. I’m not sure why she wasn’t offered the plain spaghetti, but I’m kind of glad she didn’t get that and was willing to eat a little of everything off our plates. By dessert, a chocolate tart with caramel ice cream and peanuts scattered along a line of chocolate sauce, Fuzz was ready for bed. She liked the caramel ice cream, though. So did I. We headed back to the condo and went to bed. Next day’s plans included the zoo. Again, we were up early and able to get to the zoo as soon as it opened at 9:00. The zoo is fairly close to Mission Bay as well, so it only took a few minutes to get there. I had no doubts the San Diego zoo would be excellent and it did not disappoint. The animals seemed happy, healthy and friendly – especially the gorillas were terrific. They hung out next to the glass and seemed to enjoy the attention from the zoo goers. Orangutans were a bit more shy, but still fun to watch. The pandas, which are very popular were happy to hang out and do their thing in front of strangers. But make sure you get there early so you won’t have to stay in line. We strolled right up to the pandas and looked at them for a good 15 minutes or so before taking in the rest of the zoo. It was well shaded, had plenty of pretty flowers and interesting paths. It also had a sky ride! I hadn’t been on a sky ride since I was a little girl in San Antonio. Unfortunately, the San Antonio zoo shut down their sky rides years ago and I’d sort of forgotten about them. Todd & Emma loved the sky ride. Shortly after our ride, they closed them temporarily due to high wind. So try to go to the zoo when it’s not too windy. We’re pretty good about getting through zoos quickly, but we enjoyed the experience thoroughly and will probably notice more when we get back. 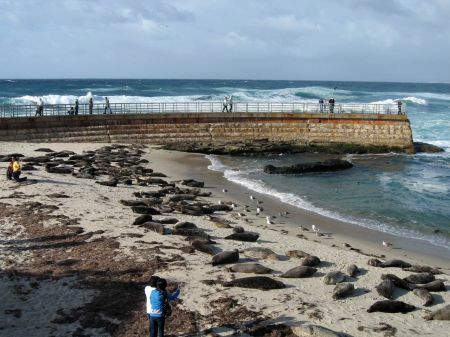 We wanted to leave some time to rest in the condo, ride the Belmont Park Roller Coaster (back at Ocean Beach) and drive over to La Jolla again to try to view the Sea Lions and Children’s Pool Beach during the day. So we left the zoo at noon and grabbed some lunch to take back to the condo. We opted for Wendy’s. Or should I say, they did. I think I ate a protein bar and more Trader Joe’s granola. The only fast food I was willing to eat in California was an In & Out Burger because I heard they were good, but we were never near an In & Out Burger at the right time. The one time we did pass an In & Out Burger, there was a line of 20 or so cars! I guess it’s a popular place. After resting from zoo & lunch, we headed over to Belmont Park to ride the roller coaster. Belmont Park had other rides besides the coaster, but it was cold and windy and we only wanted to ride one thing. After spending $18.00 on the coaster (it was worth it, I guess), we drove to La Jolla, hung out in Scripps Park, and found our Sea Lions again during the day. It was gorgeous standing on the shore watching the wind blow waves up against the rocks. Swimming wasn’t allowed because of the wind level, so we just gawked. After watching the Sea Lions, we walked up the hill to Prospect Street and found Powell’s Candy Store which was incredible. Oh, and we found a great place to retire. It’s called “La Manana” and it’s right on the cove. But back to Powell’s Candy Store, I have to say it’s a must-see. It’s a tiny store packed with every type of candy imaginable including good chocolate. They also have a nice selection of cane sugar sodas including Frosty brand vanilla root beer and Diet Dad’s. We bought a couple of those for later, loaded up on Jelly Bellies, then drove back to Mission Bay to clean up for dinner. We were actually too tired to “clean up” so we just rested and tried find a casual place. 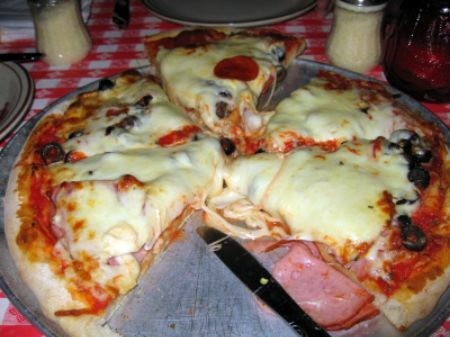 Upon recommendation from the condo owners and Yelp, we found ourselves in downtown San Diego’s Little Italy standing in a long line to get into Filipi’s Pizza Grotto. I was hoping that the line meant the pizza was awesome, but was kind of disappointed with the pizza. But the restaurant was lots of fun. It smelled good,people watching was excellent and the Chianti was only $10.00 a carafe. , They also had amazing carrot cake. So that was our experience of Little Italy, which is part of downtown San Diego. Time for bed. Next morning, we awoke again around 7. We were finally starting to adjust to California time, but sadly it was our last full day in San Diego. We decided to make the best of it by starting with a morning in Coronado, which is to the south of San Diego. Coronado is an interesting little place. It’s called an island, but really it’s a peninsula and a town unto itself with beaches, shops, hotels, a naval base and as mentioned, The Hotel Del Coronado which is the hotel the Grand Floridian in Disney was modeled after. Getting to Coronado was also fun because it involved driving across a huge bridge with an incredible view. We’d read the best beach in Coronado was the one in front of the Hotel Del, and the guide books were right. The water was cold, but the tide wasn’t too high, there was plenty of sand, and the sun shone overhead while navy fighter pilots practiced maneuvers in the air above the beach. Playing on the beach was a nice way to spend a morning, and of course I took the change to walk around and inspect the Hotel Del. Some day, I’d like to stay there! 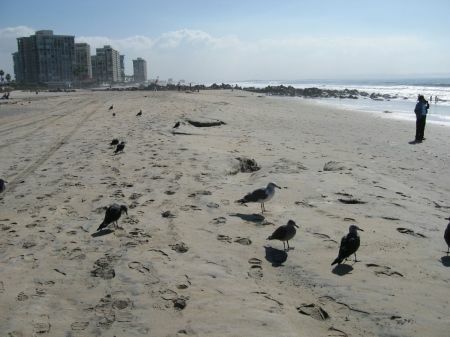 However, there are lots of other options on the island and the beach is open to the public. Warning: Whatever you do, don’t feed the seagulls on Coronado Island. Don’t ask me how I know this is a super bad idea. By noon, we were hungry again. The main street in Coronado, Orange Street, had plenty of restaurants, but Fuzz demanded “something she knew” so we bought lunch at Panera. It became very crowded around noon and we were glad we got in early. Todd had never been to a Panera, btw. He loved their soup. After lunch, we headed downtown. Todd dropped me off at the Westfield Horton Plaza to do some shopping and he and Fuzz went to the Children’s Museum a few blocks away. It’s a big museum, but has just been remodeled and is still a work in progress as far as activities go. Todd & Emma are very particular about Children’s Museums and had quite a lot to say. I keep telling Todd he should start a Children’s Museum blog. Two hours later, we headed back to the condo, rested, and prepared for our last dinner in San Diego. We chose a restaurant about two miles from the condo (at most!) called World Famous. World Famous was right on the boardwalk and packed with people from all walks of life. It was definitely a fun place to eat and the food was surprisingly good. If you are staying in the Mission Bay/Pacific Bay area, it’s a fun choice for at least one meal. I kind of wish we’d gone there first, but it was also a nice place to say goodbye to the beach from our table which was right smack next to the boardwalk. Todd had prime rib, Emma had chicken nuggets and I ordered a pasta dish with chicken and perfectly cooked vegetables. For such a beachy, touristy place, the food was excellent! Well, that’s all I have to say right now. Writing this report was a fun way to relive the vacation, but I’m glad to be back home and have laundry to do, cookies to bake and work to be done down at the elementary school. Back to real life. I work for HomeAway and wanted to say thanks for recommending one of our sites, VRBO.com, in your post. As someone who now endorses vacation rentals, I wanted to let you know about the “Why I Deserve a Getaway from HomeAway” contest in which you could win a $5,000 vacation—on us! Check out http://blog.homeaway.com for more information. I’m so glad you had a good time. You packed a lot into your trip. I’ve lived here for over 20 years now and it’s so interesting to see how people choose to spend their vacation here! I have not heard of Powell’s Candy store. Will definitely be looking for that next time in LJ. 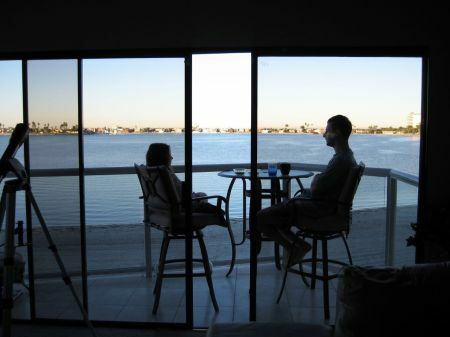 When I got married (here in SD), we all rented houses for the week in South Mission Bay. It was a lot of fun. Great place to tool around and people watch too. We’ve had great luck with VRBO in various locations of the US! We used VRBO for a condo in Destin. It was really great to use. Glad you had a nice trip! 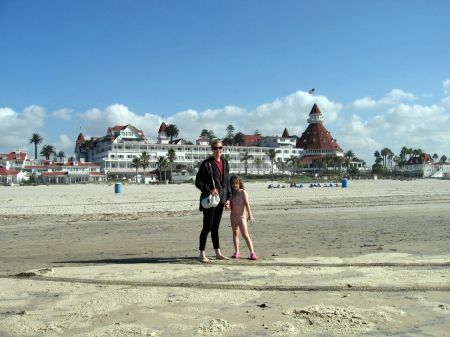 I went to San Diego once, on business, and stayed at the Hotel Del Coronado. Wouldn’t you know it was unseasonably cold when I was there? All I remember is that I packed for warm weather and I was freezing. Wow, I feel so much better about missing In & Out Burger. I don’t eat hamburgers very often, but In & Out has such a strong following I felt like maybe I should try it. I think the best hamburger I ever ate was from a place in Houston called Prince’s. Second to that, I’d say from a chain in San Antonio called Whopper Burger which was no relation to Burger King and probably doesn’t exist anymore. Third would be Dairy Queen’s burgers and fourth would be Whataburger. But that’s all based on taste memory because I haven’t eaten a fast food hamburger in 20 years. You definitely saw alot while here in San Diego! I love Mission Bay. You picked a great place to stay! I’ve been to Sea World San Antonio many times, (as I grew up in Texas) and my first reaction to San Diego Sea World was the same. It’s small in comparison to San Antonio, but a very fun day! You ate at some great spots while here. Oh, and don’t think twice about not having an In-N-Out Burger. Some Californians will not like this comment, but they are overrated. Since I’m also from Texas, if I’m going to eat a burger, I’d rather it be from Burger King or Wendys. If they had Whataburger here in CA, they would give In-N-Out some competition! Oh wow! You managed to do so many things in so little time! I wish I lived closer to San Diego, I love that area. What a great report, how can you remember what you ate at all meals? Georges is a must. We go everytime we are in town and always have wonderful food and even better sunsets. We’ve been to Columbus OH zoo (many times), Cleveland zoo, Omaha zoo, San Diego zoo, Houston zoo and of course the Phoenix zoo and our favorite is Omaha’s Henry Dourly zoo. 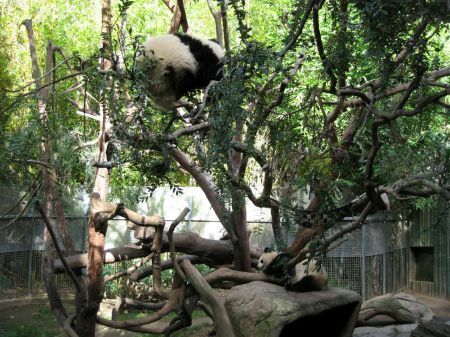 It has a fantastic rain forest and really neat aquarium, tiger exhibit and polar bear exhibit. I will admit it’s been a while since we’ve been there. When did you live in San Antonio? I used to live there and I had totally forgotten about the sky ride until I just read your blog…it brings back some great memories about Texas. You have such a great way of describing things, and it makes it very entertaining to read your blog. I’m glad you had a good time in San Diego! Glad you had a good time, I got married on the bay and my relatives stayed in a little house on the bay and it is a wonderful location. I totally agree on Georges and your other choices, and on fillipi’s being a bit rubbish. PB is very studenty and partyish, hence the smoke shops etc! I will have to go and check out powells candy store, I’ve never heard of it! Welcome home! You were missed, but I’m glad that you had such a fun vacation! Thanks for all the comments! I read and appreciated each and every one of them. I’m only going to respond to a few right now, though. It’s interesting how many readers have fond memories of either living there or traveling. I guess based on weather and scenery, it’s just idyllic. It’s also quite a food town. California, in general, has amazing food. I’ve also noticed in my contest experience that a lot of the the best cooks come from California. Lisa, how lucky you were to grow up on Coronado! I think next time, we will either stay there or in La Jolla. I’d like to stay at the Hotel Del, but there are other options in Coronado as well. But Mission Bay was perfect for getting from place to place. Tiffany, thanks for the tip on the Tide Pool! I hope people planning trips will see your comment. Barbara, definitely file it away in your travel folder! Cindy, I had high expectations for the zoo too, but loved it. If you see this, please let me know what your favorite, best-ever zoo is. We liked this one and the London zoo, but Birmingham zoo is very nice and Chicago’s Pritzker (Lincoln Park) zoo is fabulous and FREE. We need to hit the Bronx zoo next. Sharon, thanks! I’m sure I didn’t cover everything, but your insider’s point of view (and validation on our choices) is much appreciated. We didn’t make it up to the Ocean Terrace. About George’s. I hope to eat there again because there were a lot of other things on the menu that looked good — specifically, the fresh minestrone with fresh vegetables from a nearby farm. La Jolla had a ton of other great restaurants too, but we felt like we needed to try restaurants all over the city rather than just stay in La Jolla. Megan, Sea World San Antonio has quite a few large rides — the Steel Eel and Great White are two huge (and awesome) roller coasters and there’s a log ride too. There’s also a big swimming area. But like I said, I kind of liked San Diego’s smaller size. Susan, I saw quite a few law schools and figured a lot of the people nearby were law students or lawyers. Sadly, the after we left San Diego (today), the San Diego Bay Food & Wine fest began. What timing. You made me miss California! I’m glad you guys had a great time there. I used to live near San Diego many years ago. The next time we go, we will have to take J to the zoo and to Lego Land (of course!). My kind of weekend! I live in San Diego and lived on Sail Bay when I was in law school. LOVE the area and reading about your weekend makes me want to spend our next weekend down there! Love San Diego. Sounds like a great trip! I’m working on it, but it sure takes time! Growing up in So. Cal, we have taken many trips to San Diego. We took the kids last summer, and reading your story makes me want to go back – it’s everything you said – pretty, clean, fun and lots of stuff to do with kids.I only know the SD Sea World, so it was quite a shock to hear how small it is compared to Austin. To me, it seems large, but everything is relative, right? Glad you had such a nice trip! I went to SD for four days in April, I hadn’t been there since I was a kid. We had a great time, but didn’t have time to do everything we wanted, hopefully we’ll be back again soon. We hit two outstanding bakeries, Bread & Cie and Extraordinary Desserts. HIGHLY recommended if you make it back to SD, especially Extraordinary Desserts. Thanks for the info on VRBO, something to look into. I’m so happy you enjoyed San Diego! You definitely hit up all the best hot spots. Did you go up to the Ocean Terrace at George’s? I saw the most beautiful sunset there last weekend. We went to San Diego for the first time last January. We went whale watching, walked the beach, spent an entire day at the zoo (we were a bit disappointed, I guess our expectations were too high), and went tide pooling at Cabrillo Monument. Will add your post to my “want to do” list for whenever we get back! Anna, I so enjoyed your writing and pictures about San Diego. One of these winters we are going to head there to get away from the cold. I’ll going to copy your post to put it in my travel folder. I lived in CA (San Diego) for 30+ years and really miss it a lot. I moved to FL 4+ years ago to help my elderly parents and still miss CA. Thanks for the report as I can relate to all you saw there and it made me “homesick”. Although I will never be able to afford to move back to CA, it will still hold a special place in my heart forever. I love San Diego too. I lived there when I was in high school. One time after we moved to LA, we flew down to San Diego in a tiny little plane. I’ll never forget that. Scary!! I’ve stayed at the Hotel Del Coronado, it beautiful. That sounds like a great get-away! I’ve never been to California – maybe someday. Thanks for sharing your trip! oh my gosh you make me miss San Diego soo much. I am so glad that you had fun in San Diego! I was actually raised in Coronado but I am at school in Seattle and your report made me excited about going home for thanksgiving. You should go back to San Diego over the summer. In coronado they have free concerts in the park on Sundays and you can go to baseball games at petco park in the downtown gaslamp district. The next time you are back and go to the zoo, I would recommend lunch at the Corvette Diner in hillcrest. It is a 50’s style diner that is great for kids and a San Diego landmark of sorts. It is also near the uptown Trader Joes and Whole Foods, so you can pick up groceries afterwards. I am so glad you had fun! I LOVE SAN DIEGO!!! You just reminded me why, through your beautiful photographs.